CYMA is the airsoft brand you want when you’re looking for cheap, low-level airsoft guns. This is a brand for beginners and players who don’t want to invest too much in a gun but also don’t want low-quality products that break apart in your hands. The company behind the brand is located in China, but you can find their airsoft weapons and accessories all over the world. They are present in most online stores, and you will most likely find at least one CYMA gun on every airsoft field. They are known all over the world for producing low price AEGs and spring guns, but it’s not clear how they started. As a result, it was difficult to put together a history of their guns. However, I know that besides AEGs and spring designs, they also produce clones of high-end brands such as Tokyo Marui. These guns are above average in quality but cost a lot less than the originals, which is why players are drawn to them. In the last few years, CYMA also started producing better AK rifles (mostly clones from other brands) and higher quality M4 replicas. These are the guns that provide a reliable dollar to quality ratio, and players consider them perfect for beginners. 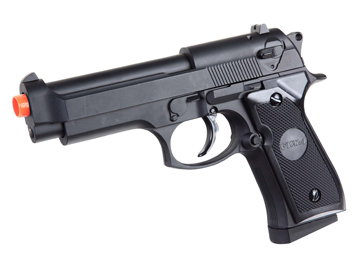 CYMA first got famous by producing low price airsoft guns. As you can imagine, they did skimp on quality, but nowadays, their guns are known for solid bodies and overall good internal quality. True, they have some problems with the quality control as some guns arrive with terrible packaging and the quality cannot be compared with other, more reliable brands. However, they remain the go-to brand for beginners! Prices can start as low as $50 and can go as up as $200+. As you can imagine, the higher the price, the better the quality of the weapon. Since they have a wide range of airsoft weapons, I only selected the ones most popular among players. The perfect sniper rifle for beginners or players who want to test the sniper role and see if it fits. The rifle has a solid ABS body, with full-metal inner and outer barrels, which creates a more realistic feel when you hold it. CYMA equipped the ZM51 design with a metal bolt, which allows for faster follow up shots. The long barrel, good accuracy and a 20mm weaver rail on top of the bolt assembly, this rifle has all it takes to introduce someone to the world of sniping! Furthermore, the ZM52 shoots at about 400 FPS and has adjustable hop-up, which allows the shooter to adjust for various wind conditions and ranges. Overall, this is a good cheap sniper rifle! With a full metal build, this M9 pistol feels heavy and solid in your hands. The magazine holds 15 rounds and it shoots at about 250 FPS. The side grip covers are great for increased gripping power and the trigger guard is large enough to use the pistol with gloves. Overall, this is a fantastic side weapon, that features good quality and a very low price. As I already mentioned, CYMA has several AK designs that feature good build and high-quality internals. This AK-47 model is the perfect example as it comes with a metal and ABS body, upgradeable gearbox and full-metal internals (it is compatible with Tokyo Marui’s AK-47). The rifle shoots at about 380 FPS, has a rate of fire of 66- BBs per minute and can hit the target from around 100 feet. The engine is fueled by an 8.4v NIMH battery (although the full-size stock allows for bigger ones), and the high-cap magazine is a definite advantage on the field. The RIS system is great for installing various accessories and I love the pistol grip and front and rear sights. Overall, this AK-47 is an impressive piece of airsoft weaponry and it can be used by both beginners and advanced players. It is reliable, solid, and spreads the BBs like no other! If you’re looking for the classic look of an AK47 but don’t want to make a big investment, the CM022 AK47 from CYMA is the perfect choice. The body and gearbox are made of durable ABS polymer and the magazine holds 350 BBs. Even if the body and internals are all plastic, the rifle shoots at about 240 FPS and has a safe/semi/full auto fire selector. At the end of the day, this may not be the most durable or reliable AK-47 design, but it is one that’s perfect for beginners or kids who just started playing. This is a close replica of the Bizon SMG, a badass gun that combines the durability of an AK-47 to the power of a Dragunov sniper rifle. Designed to be used by law enforcement and counter-terrorism agencies, the airsoft submachine gun is compact, has a high rate of fire and works amazingly well in CQB situations. The Version 3 metallic gearbox and the 8.4 1200 mAh NiMH stick battery fit perfectly into a metal body equipped with an easy folding stock. Completed by a midcap magazine that holds 120 rounds, the Bizon SMG from CYMA can shoot at about 400 FPS, so you can only imagine the damage it will do on the field! Overall, this is one of the best airsoft weapons produced by CYMA as it comes with high-quality internals and body and you can count on!